I recently spent to night at this hotel and I had a great experience. The food was good; the rooms were super tidy; and the customer service was impeccable. I highly recommed. 14-Apr-2019 Verified Review, stayed from Fri Apr 12 to Sun Apr 14 2019 at a $205.91 average nightly rate. Pool/service was excellent. Boheme Breakfast and valet was great. So glad we stayed there. 01-Apr-2019 Verified Review, stayed from Thu Mar 28 to Sat Mar 30 2019 at a $331.00 average nightly rate. The Grand Bohemian Hotel's 250 guest rooms, including 36 suites, feature a luxurious environment of lush velvet drapes and deeply toned Java wood. All-white pillow-top beds and spacious baths with telephones create the ultimate private hideaway. Stay productive with ample work areas featuring dual-line phones and high-speed Internet access. On our 15th floor Concierge Level, guests desiring the very best in service enjoy stunning views and exclusive amenities including — complimentary continental breakfast and evening hors d'oeuvres in the private concierge lounge. The Grand Bohemian Hotel—ideal for business or pleasure. 24 Hour prior to check-in. Nearest Airport is MCO (Orlando international Airport. It is approximately 11 miles away. We do not offer shuttle service to and from the airport. Average one-way taxi expense is $35. 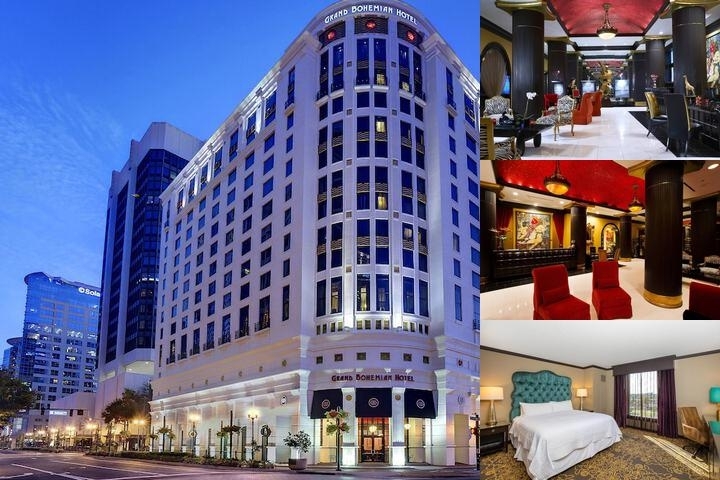 Below are the meeting, banquet, conference and event spaces at Grand Bohemian Hotel. Feel free to use the Grand Bohemian Hotel meeting space capacities chart below to help in your event planning. Hotel Planner specializes in Orlando event planning for sleeping rooms and meeting space for corporate events, weddings, parties, conventions, negotiated rates and trade shows. 46 x 54 x 11 Ft.
46 x 27 x 11 Ft.
26 x 22 x 10 Ft.
29 x 25 x 10 Ft.
29 x 29 x 10 Ft.
35 x 15 x 9 Ft.
27 x 12 x 8 Ft.
36 x 36 x 24 Ft.
29 x 13 x 9 Ft.